Other states are looking to Washington State’s Profiling Law as a model, so this is important to all riders. ABATE and the Council of Clubs of Washington State, collectively representing thousands of the state’s registered motorcyclists, is requesting support and sponsorship of a simple, cost-free amendment to the law addressing motorcycle profiling. In 2011, every legislator in Washington State passed RCW 43.101.419 into law. ABATE and the COC believe the law has been mostly a success, but the problem has not been eliminated. Although reports of profiling are nowhere near pre-2011 levels, and incidents have been reduced since 2011 overall, there has been an uptick in incidents reported over the last 3 years. Many believe that a 2014 case State Of Washington v. Kenneth Kelly, a civil proceeding involving the Bandidos Motorcycle Club, may be responsible for this increase. A classic case of profiling, motorcyclists prevailed on a 4th amendment duration of stop challenge. But 43.101.419 was explicitly questioned. 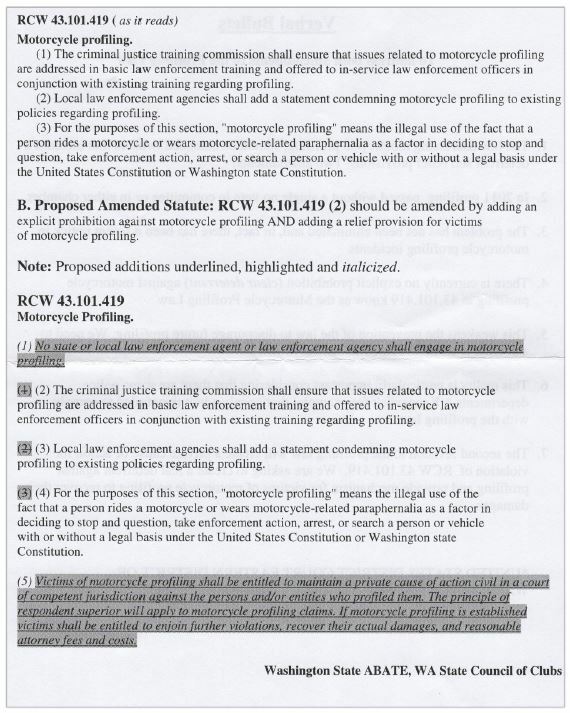 Although the current law requires that training and policy statements on motorcycle profiling be integrated with current training and policies on profiling, the District Court in Eastern Washington, asked to interpret 43.101.419, concluded that the lack of an explicit prohibition or a relief provision makes the law unenforceable in Federal court. This weakens the deterrent affect and the ability of the law to discourage these incidents from occurring in the first place. Fortunately, there is a simple quick-fix. We need to add teeth to an otherwise solid statute. An amendment adding an explicit prohibition against motorcycle profiling and a relief provision providing injunctive relief, actual damages, and attorney fees, would be a cost-free solution to strengthening the law and more fully fulfilling the original intent of the Washington State legislature. The implications extend beyond Washington’s borders. As the first state to address the issue, Washington’s statute is being modeled by other states seeking to address motorcycle profiling. Improving Washington’s statute improves law coast-to-coast. Why a relief provision for motorcycle profiling? In closing, some have asked why the motorcycle profiling law needs a relief provision when the state’s racial profiling statute contains no relief provision. This is a very important question considering that the motorcycle profiling law is directly modeled after the racial profiling statute. There is a very good answer. The racial profiling statute itself contains no private cause of action because it is unnecessary. Race is a protected class and a victim of racial profiling currently has two mechanisms for a private cause of action. First, the federal civil rights act. Second, the Washington State Civil Rights Act. Both contain a private cause of action for victims of racial profiling. Because motorcyclists are not considered a protected class, these two paths do not exist for victims of motorcycle profiling. Importantly, beyond Washington, motorcycle profiling is a national discussion. 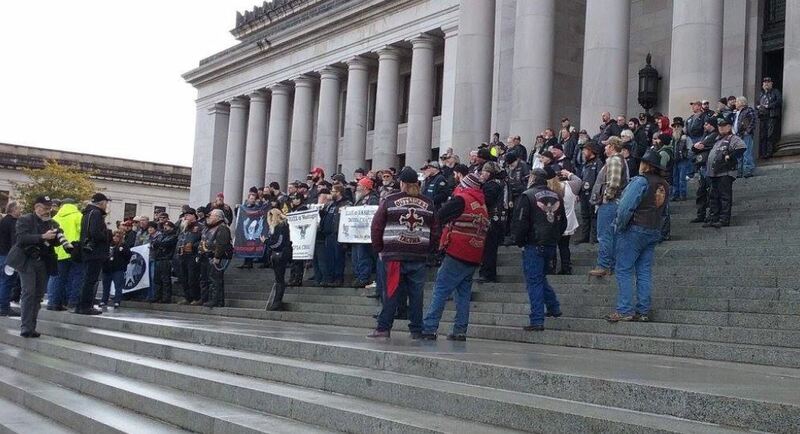 Other states seeking to address motorcycle profiling are watching Washington’s lead. A simple quick fix adding an explicit prohibition, and a mechanism of relief for victims of profiling, will add teeth to this legislature’s directive and help end the practice of profiling in our state.